Many parents cringe when their child asks for help with math homework. New research shows that poor math skills can cause another difficulty for caregivers — measuring the right amount of medicine. In fact, parents with math skills at the third grade level or below were five times more likely to measure the wrong dose of medication for their child than those with skills at the sixth grade level or higher, according to a study presented at the Pediatric Academic Societies (PAS) annual meeting in Boston. "Parents face many challenges as they seek to administer medications to their children in a safe and effective manner," said study co-author H. Shonna Yin, MD, MS, FAAP, assistant professor of pediatrics, New York University School of Medicine and Bellevue Hospital Center. 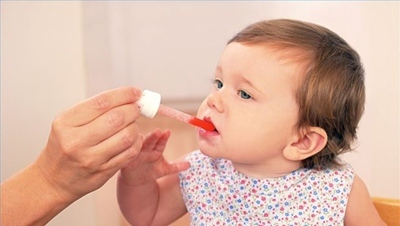 "Dosing liquid medications correctly can be especially confusing, as parents may need to understand numerical concepts such as how to convert between different units of measurement, like milliliters, teaspoons and tablespoons. Parents also must accurately use dosing cups, droppers and syringes, many of which vary in their measurement markings and the volume they hold." Studies have shown that people with low reading skills are more likely to make mistakes in measuring the correct amount of medicine. Little research, however, has focused on whether low math skills contribute to dosing errors. In this study, researchers looked at the relationship between both reading and math skills and medication dosing errors. Participants included 289 parents of children younger than 8 years of age who were prescribed a short course of liquid medication after being seen in a pediatric emergency department. Caregivers spoke either English or Spanish and were the primary person responsible for administering the medication. Caregivers were given three tests to assess their reading and math skills. Researchers also watched parents as they measured out a dose of the medication that had been prescribed for their child. Study results revealed that nearly one in three parents had low reading skills, while 83 percent of parents had poor numeracy skills (27 percent had skills at the third grade level or below). Observations showed that 41 percent of parents made a dosing error. Parents' math scores, in particular, were associated with measuring mistakes, with parents who scored below the third grade level on the math test having almost a five times increased odds of making a dosing error. "Our study found that many parents have poor numeracy skills, placing them at risk for making dosing errors," Dr. Yin said. "These findings point to a need to examine whether strategies that specifically address parent math skills can help reduce medication errors in children. In addition, recognition of the importance of addressing numeracy skills may be helpful for health care providers as they seek to improve their communication of medication instructions. For example, having providers review and give parents pictures of dosing instruments filled to the correct amount for that prescription may be beneficial."